Sony KD-65ZF9 4K LED/LCD (2018) hands on review | What Hi-Fi? The Master Series represents the new top-of-the-range in Sony’s TV line-up, and is designed to get closer to the content creator’s intention than any commercially available television has done before. How Sony set out to make the most accurate TV possible and ended up with two models using entirely different tech is a question for which we’re yet to receive a satisfactory answer. The main difference is that the AF9 is an OLED that evolves the unique design and approach of the company’s much-loved A1, while this ZF9 is an LCD model with a direct LED backlight – essentially the successor to the ZD9. 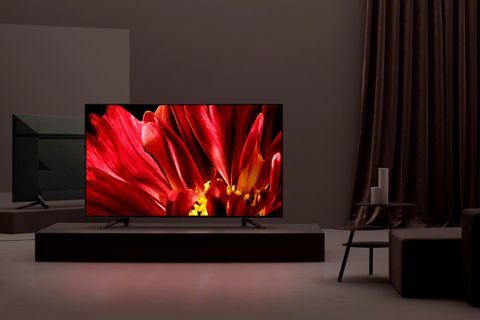 That might make the ZF9 sound like the poor relation of the two but, as Samsung has recently shown with its Q9FN, traditional backlit TVs are capable of mixing with even the best OLEDs. Having briefly seen the ZF9 in action, our concern is that its performance appears to be a little too much like that of the rather aged model it replaces. Compared to the easel-like design and innovative speaker solution of the AF9, there’s not a huge amount to say about the appearance of the ZF9. That’s not to say that the ZF9 is unattractive – it just doesn’t stand out from the crowd. Although we do like the abstract angles of the set’s two feet and the speckled finish of the bezel (which Sony says is similar to that of a DSLR camera), the event space and demo rooms at Sony’s launch were gloomier than a goth’s bedroom, so we couldn’t really be sure. Sony is also promising ‘clean cable management’, which presumably involves a channel in one of the feet for your wires to run through. Sony’s new Master Series is designed to deliver maximum accuracy, and it’s in comparison with Sony’s BVM-X300 reference monitor (used by practically every movie studio of note) that this accuracy is most evident. The delivery is remarkably balanced, controlled and nuanced, and is particularly strong when it comes to colour reproduction in shadows and gloom. This is a bright performance too, predictably more so than the AF9 OLED - and the combination of punch, light detail and sharp edges makes for an engaging, dynamic picture. Sony refuses to reveal just how many independently dimmable zones the ZF9’s direct LED backlight has, or even whether it’s more than the old ZD9 - which leads us to suspect it probably isn't. Whatever the figure, though, our early demos suggest this backlight is a bit flawed, struggling to produce genuinely deep blacks in anything like close proximity to bright picture elements. This is most clearly seen in the black bars at the top and bottom of the movie clips shown at the event, which weren’t exactly black. And it is also evident in other dark images, which are more grey and washed out than they should be. We’re aware of the traditional limitations of backlights, but with the Q9FN Samsung has shown these can be overcome with clever engineering and lots of LED zones. On this evidence, it doesn’t look as though the ZF9’s backlight is as sophisticated. We’ll have to wait to test the TV ourselves to be sure. One nut that Sony does appear to have cracked is that of viewing angles. Backlit TVs almost always suffer in this regard, losing contrast and vibrancy when viewed from an angle. The ZF9 does not appear to suffer in this way, with the picture remaining consistent even at very wide angles. Interestingly, a side-by-side comparison with the ZD9 suggests the extended viewing angles represent the main improvement for the ZF9, as both sets otherwise look similar during a brief demo. That’s a slight concern. The ZD9 is an excellent telly - but it’s also two years old, and we would expect the ZF9 to be a bigger step-up. Again, it may yet prove to be so once we get it in for our own test. Firm conclusions are impossible to draw from a brief glimpse at an event. Unlike the AF9, which gets a new version of Sony’s screen-shaking speaker tech, the ZF9 appears to feature more traditional, small drivers hidden in its chassis. Sony has so far offered no information on the ZF9’s integrated sound solution and we weren’t able to hear it in action during the event. We’ll have to wait until we get a review sample before we know whether it sounds any good. While it’s impossible to form firm conclusions from a brief demo at an event - for all sorts of reasons, most obviously a lack of time and control over settings and material – our early impressions are impossible to ignore. And for the ZF9, those first impressions are mixed. Colour reproduction appears to be supremely authentic and the bright, punchy approach is enticing. Those viewing angles are impressive, too. But we have reservations over the depth of its blacks and aren’t yet convinced that this is a big step up from the older ZD9. We hope it is, as that will make it a real stunner of a telly, but right now it’s the AF9 that’s the Master Series TV we’re most excited about. Of course, pricing probably will play a big factor. It hasn’t yet been announced for the ZF9, which will be available in 65in and 75in sizes. We will keep you informed when we get that information, so stay tuned for our full review in due course.